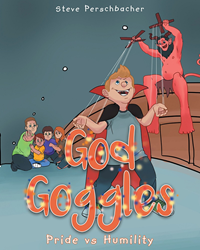 Author Steve Perschbacher’s newly released “God Goggles: Pride vs Humility” is a illustrated story about a family’s encounter with a special pair of googles. “God Goggles: Pride vs Humility” from Christian Faith Publishing author Steve Perschbacher is a story of faith and the effects of a strange object on a family along with the lessons it brings. “God Goggles: Pride vs Humility”: an exciting and inspirational illustrated story concerning a family’s relationship with God. “God Goggles: Pride vs Humility” is the creation of published author, Steve Perschbacher, is a husband and father of three who lives on a farm in Illinois. Published by Christian Faith Publishing, Steve Perschbacher’s new book is a heartening children’s book where a family has an encounter with a special pair of goggles. This happy family comes across a greater understanding of faith through the goggles and learns lessons of pride and humility. With a clear moral and vivid pictures this story helps impart an important lesson for the faithful. Through the experiences of the family the readers absorb a vital lesson from the teachings of the Bible. View a synopsis of “God Goggles: Pride vs Humility” on YouTube. Consumers can purchase“God Goggles: Pride vs Humility” at traditional brick & mortar bookstores, or online at Amazon.com, Apple iTunes store, Kobo or Barnes and Noble. For additional information or inquiries about “God Goggles: Pride vs Humility”, contact the Christian Faith Publishing media department at 866-554-0919.